We had a good day yesterday sailing all day with speeds between 3.5kts to 7kts. After our bad first day it was good to be sailing in the right direction on a course of 260 to 270 degrees. We both had sleeps during the day and felt refreshed. No more fishing. The winds became lighter in the afternoon and we thought we were going to have to put the engine on but we seemed to have picked up a knot of current which is helping our speed so continued sailing. At midnight the wind suddenly dropped so the engine went on and we motor sailed through the night. At 5am this morning it dropped completely so Bill took the sails down otherwise they flap noisily which damages them. This morning the sea is glassy smooth with a light swell so we’ve been able to start heading south west on a course of 230 degrees. According to the grib files it looks like a day of motoring and possibly some northerlies starting up this evening. Still 907 miles to Richards bay, a lot can happen in those miles. I’m baking bread today and maybe some muesli cookies. 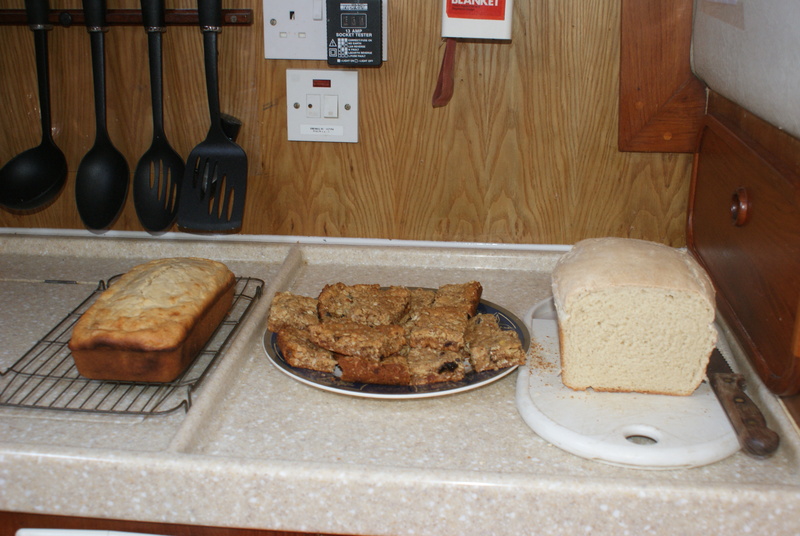 Banana bread, muesli cookies and fresh bread, yummy. On an admin note for the followers of my net I’m going to go straight to 8110 at 09.00 local time from now on so that the boats still in the Nosy Be area can hear the boats on passage. Please pass it along and could someone put a note to that effect on the Indian Ocean facebook page. Thank you. Posted on October 16, 2016, in Circumnavigation, Port posts, Sailing. Bookmark the permalink. Leave a comment.